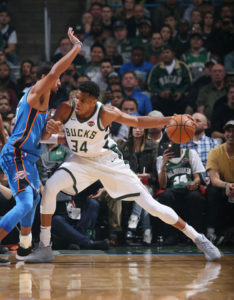 The Milwaukee Bucks struggled to get good offensive looks and when they did, they struggled to make shots in a 110-91 loss to the Oklahoma City Thunder on Tuesday night at the BMO Harris Bradley Center. The Thunder worked hard to make life difficult for Bucks star Giannis Antetokounmpo and the rest of the Bucks team wasn’t up to the challenge. Milwaukee jumped out to an 8-4 lead, then went six-plus minutes without a basket. The Thunder went on a 16-0 run and the Bucks could never get back in the game. Antetokounmpo finished with 28 points on 9 of 14 shooting, but no other Bucks player reached double figures. As a team, the Bucks shot 42% from the field and 30% from three-point distance. They also turned it over 15 times. Paul George led the Thunder with 20 points. Carmelo Anthony added 17 and Steve Adams collected 14 points and 11 rebounds. Last years MVP Russell Westbrook had 12 points, 10 rebounds and nine assists. The Bucks head to Charlotte to face the Hornets on Wednesday night. It’s the second meeting between the two teams. The Bucks picked up a 103-94 victory on Oct. 23 in Milwaukee. Russell Westbrook had 12 points, 13 rebounds and 13 assists to post his record tying 41st triple-double of the season as the Oklahoma City Thunder rolled to a 110-79 win over the Milwaukee Bucks on Tuesday night. The Bucks did little to provide any resistance in what turned out to be their worst defeat of the season. Westbrook wrapped up his triple-double with 9:17 left in the third quarter. He was able to get plenty of rest, playing only 27 minutes before giving way to the Thunder bench. The Bucks trailed 63-39 at the half and just didn’t have it. Michael Beasley led the way with 14 points in 12 minutes off the bench. Giannis Antetokounmpo added 11 points and 10 rebounds in 24 minutes.